Though Saturday morning dawned overcast and drizzly, thousands of Chicagoans remained undeterred as they descended upon downtown Grant Park in search of all the tamales, cheesecake, blintzes, churros, deep-dish, pad thai, and kimchi fries they could eat at the city’s annual Taste of Chicago food festival. Touting itself as the “nation’s premier outdoor food festival”, Taste of Chicago was founded in 1980 as a one-day celebration of the city’s culinary culture and diversity. In the nearly forty years since, it has grown to become one of Illinois’ largest tourist attractions, drawing more than one million visitors in 2017. Lured in by the prospect of free admission, live music, and the chance to sample foods from some of Chicago’s most iconic eateries, I joined the masses of people in Grant Park this weekend, umbrella firmly in hand. Positioned opposite classic Chicago landmarks like the Congress Hotel and the Art Institute, the location itself provided a picturesque backdrop for the colorful arch welcoming us to the festival. Once there, we made our way to the ticketing booth. Though admission to the event itself is free, food and beverage tickets are sold in strips of 14 for $10. Prices of food were then delineated by number of tickets; for example, a full-size Polish sausage cost twelve tickets. If this seems expensive, you’re not alone: a common complaint of the event is the elevated price of food compared to what you would find in the restaurants’ permanent locations. However, most vendors also offer a smaller, “Taste Of” portion size of the same foods for four to six tickets. This proved to be the perfect way to sample many different dishes without immediately getting full. The sheer culinary variety of the event was especially impressive. 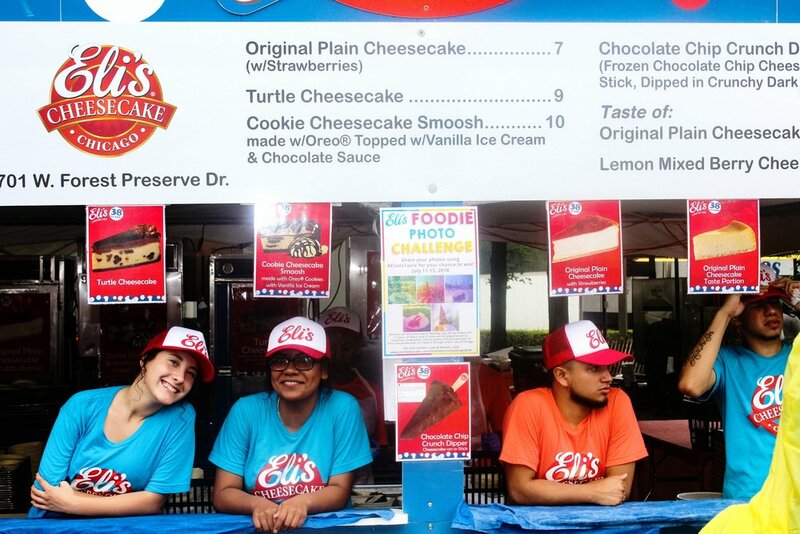 In addition to classic festival fare such as Chicago-style hot dogs, corn on the cob, and ice cream, international cuisine was well-represented with everything from jerk chicken to yakisoba to paletas, or Mexican ice pops. Some of the more interesting offerings included an ube (purple yam) cookie and gator sausage bites with real alligator meat. (No, they didn’t taste like chicken–more like a tangier pork. Yes, they were surprisingly good). In addition to a wide selection of restaurants whose booths remained open for the entire duration of the five-day festival, Taste also hosted a number of pop-up locations for a one- or two-day run. I was lucky enough to sample the chicken and waffle balls–piping hot, bite-size pieces of fried chicken served with crispy waffles and drizzled with maple syrup–from festival-exclusive establishment Papa Luke’s Gravy Balls before they were gone. 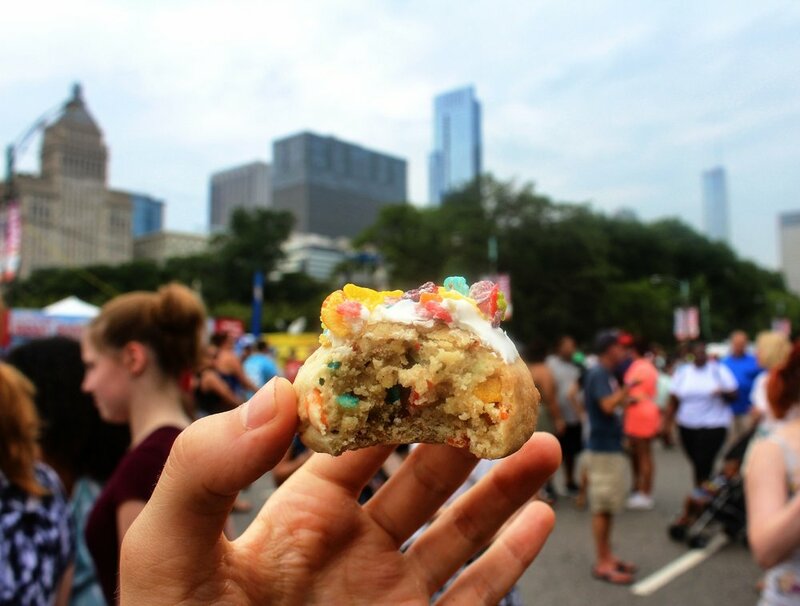 Another standout was a melt-in-your-mouth Fruity Pebbles cookie from West Loop’s Warm Belly Bakery that tasted just like the iconic breakfast cereal. As we wound our way to the tail end of the park, the rows of restaurant booths tapered off to make room for food truck after food truck. Many of these are likely familiar to those who frequent the weekday food truck lineup on Ellis Avenue–Beavers Coffee & Donuts, The Fat Shallot, and the famous Harold’s Chicken were just a handful. Comfort food seemed to be the standard here, with nearly every truck offering one or more of grilled cheese, stuffed-crust pizza, hush puppies, or mac & cheese loaded with everything from lobster to pot roast. While the savory options looked amazing, my sweet tooth instead drew me to a piece of Auntie Vee’s velvety sweet potato and cream cheese pie to close out the day of eating. By now, the morning’s drizzle had long cleared up to reveal rays of late-afternoon sun. The number of attendees had also doubled as the rest of Chicago joined those early-morning troupers, and the street filled up with the clamor of voices and haze of barbecue smoke. We left just as the sun began to set; however, the event was still packed and would be going strong late into the night. As someone from a large city, I thought I was no stranger to food festival culture, but Taste of Chicago proved to be a different experience altogether. The vibrant location, wide variety of food, and sheer number of people truly transformed it into a celebration of Chicago’s diverse community and culinary scene true to the festival’s original vision. Make sure to check the forecast and dress for the weather. A light drizzle may not have been a big deal, but trying to enjoy chicken satay in a monsoon would put a damper on anyone's experience. Temperatures have also soared in years past, so bringing a bottle of sunscreen might end up being a smart move. Pack a water bottle or two if you don't feel like splurging on inflated beverage prices–better to save your tickets for the food. Take a lap or two around the park to scope out your vendor options before committing. Tickets disappear fast, and it's too easy to blow them all on a full-sized meal right off the bat only to realize your favorite Pilsen taco spot is manning a booth at the very back. Sticking to the "Taste Of" portions will also help keep your appetite and number of tickets high if you're set on sampling as many of Chicago's iconic dishes as possible. Come hungry! 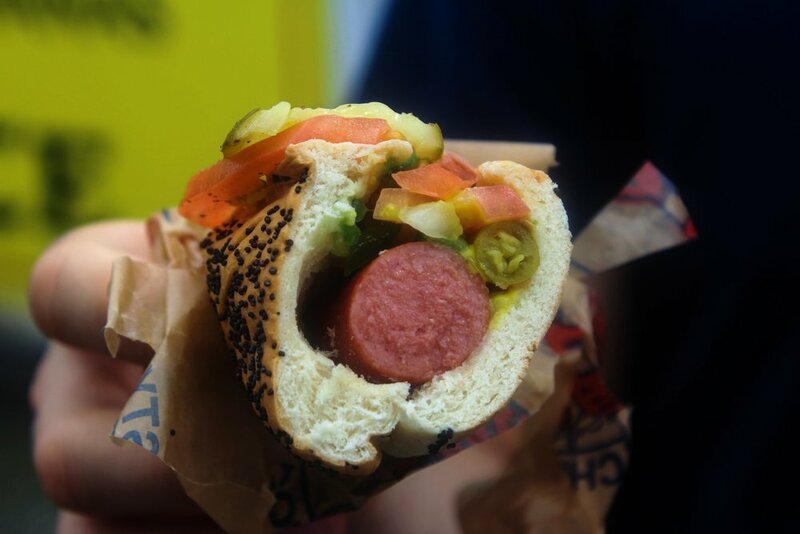 Unless you're on a tight schedule, take the time to explore Taste of Chicago and really see what it has to offer. Though the food is undoubtedly delicious, it's the sense of community created in the variety of different people and cultures coming together that takes Taste from a simple food festival to the well-loved attraction it has become. From the pickiest of eaters to the most discerning of food critics, every visitor is certain to leave satisfied and eager to return.